We all know that wrestling is fake, but this had to hurt. For real. On WWE’s Monday Night Raw, John Cena was in the ring with Seth Rollins, and while the outcome of the fight may have been predetermined, the connection of this knee to Cena’s nose very probably wasn’t. Somehow, Cena carried on with the fight, defending his title. It can’t have been easy, because the pain of a broken conk is unbearable! 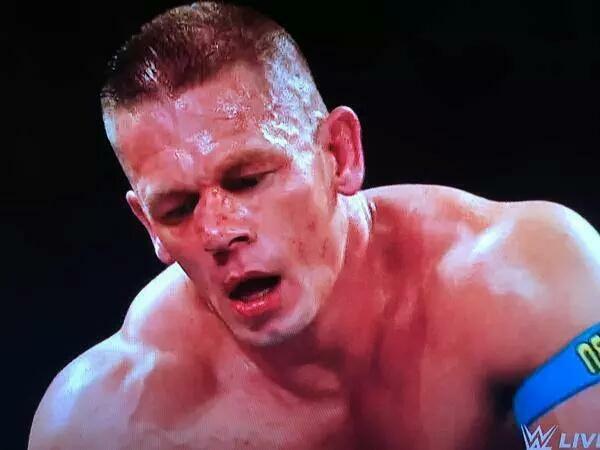 As you can see on television tonight, John suffered from a nasal fraction,” confirmed WWE physician Dr. Steve Daquino. “He’s got quite a bit of displacement, so we sent him over to the local emergency room so he can be evaluated by the ears, nose and throat doctor who’s on call tonight and see what can be done to properly repair it. Here is the incident, the aftermath, and the full match, because it’s a guilty pleasure and you know you like it.